Attachment theory explains why breaking up is so painful even when you know you are not right for each other. You know in your head that you are not good together but the thought of separating is excruciating. The basic processes of attachment and bonding occur when you are close with someone: you have opened up to each other, lived together, been sexual and romantic and just felt better being together. These positive and loving experiences make us feel safe and close and we become deeply attached. Later when the relationship issues come up, most of us don’t realize how deeply attached we are until we try to be apart. Breaking a deep attachment bond is one of the most painful experiences a human can have. We are wired to develop bonds with each other, especially during a period of pleasure and closeness. Originally in our lives, if all goes well, we grow up feeling securely bonded to our parents and families. This process has deep survival value for us since our parents are bonded to us and we to them. When this process does not go well, we develop insecure bonds and anxiety when our parents are not there for us no matter what the reason. Our parents may be ill, may die or be overwhelmed by their own problems. When we come out of a family with attachment anxieties, getting close to a lover is even more wonderful for us as it meets a deep hunger. Some children however are observed to have broken attachments with their families and then wall off and avoid getting attached again. In general, in love, we develop either secure, anxious or avoidant attachment styles. When those who are anxious get together with those who are avoidant, it will be a painful coupling full of hurt and confusion. There are many other reasons that couples break up besides attachment styles: betrayals, addiction, incompatibility with life goals, cultural conflicts, etc. 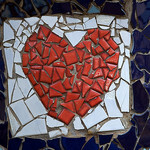 Even though you know that you are not a good match, that does not lessen the pain of a broken attachment. We are wired to be bonded and losing that bond causes sleeplessness, loss of appetite and despair. When children are separated from their parents, they protest in the same way that lovers breaking up protest. It helps when getting through the loss of an attachment that you understand what is happening and not view the pain as meaning that you are good partners when you know you aren’t right for each other. Many people need therapy to help them with the emotional pain of a breakup. It becomes too much for your support network and eventually they are worn out with the topic, usually before you are finished with processing through the experience. To find out more about getting therapy for this from Dr. Gresham, please click here for contact information.